By joining the Bayoushooter forums, you agree to adhere to the following rules. All facets of the forum, including but not limited to each forum section and private messages. By agreeing to the forum rules, you agree that you will not post, private message, or link to any content which is defamatory, hateful, threatening, abusive, vulgar, contains adult or objectionable content, encourages unlawful activity, or otherwise violates any laws. While we appreciate passionate and informed discussion we will not allow rudeness, insulting posts, personal attacks, purposeless inflammatory posts, or trolling. If you do not like a thread or do not have anything positive to say, do not post anything at all. It is not permitted to advocate, encourage, or condone unlawful physical violence, threats of violence, assault, or harassment against anyone, whether members of these forums or not. It is also not permitted to post personally identifying information of another user without their express consent. Violating this rule can lead to an immediate ban. Members who consistently post argumentative and divisive messages will be removed from the forums. *This is especially true in Law Enforcement threads. *Posts include bickering, arguing, generalizing, or denigrating LE service or citizen actions, will be deleted. *The moderating staff will be the sole decider of the tone/intent of a post. *Posts deemed to be in violation of our rules will be deleted and may result in infractions. This rule is not meant to stifle the civil discussion of laws or other current issues relevant to gun owners, instead it is to allow these discussions to flourish as opposed to devolving. Critiques of individuals, site sponsors, or advertising partners should be done in the spirit of constructive discourse. Please speak to others with respect regardless of how you may view their position. While we certainly appreciate broad discussions and try to allow threads to run their course, we do not want entirely unrelated comments posted. Our forum is able to stay in existence thanks to the sale of advertising space. If you would like to advertise please contact a member of the moderating staff. Posts may be edited and/or deleted in order to conform to copyright law. Each member is allowed only one login account. This especially includes banned users. Do not post on the forums questioning moderation decisions or the integrity of the moderators. Questions about moderation decisions can be addressed via the Private Messaging system. Be respectful of the moderators, both in the forums and in any private communications you have with them. Many of our members are military veterans or law enforcement, and as such we have great respect for these communities. We have had issues in the past with users falsely claiming to have been members of these communities, and as such we will require anyone making said claims to provide proof of service. Failure to provide proof of service after making claims will result in an immediate ban of the user's account. Furthermore, this rule need not apply only to law enforcement or veterans. Anyone making claims that prove to be false that could potentially be detrimental to the forum or its user-base will be removed. An example is claiming to be a lawyer and issuing legal advice. All forum posts are property of Bayoushooter and the poster, as such, we are not obligated to remove any content once posted. 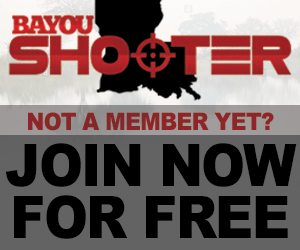 When you post on the forums, you are giving Bayoushooter a non-exclusive, irrevocable, permanent, unlimited license to use, distribute, publish, or re-publish your content. You retain copyright over the content. Posts on the Bayoushooter forums cannot be used outside the forums for monetary purposes without the consent of the poster. Bayoushooter will not gather information other than that needed to run the forums. Bayoushooter will not rent or sell your personal information, including your email address, to any other entity. Bayoushooter is not responsible for the content, accuracy, completeness, or usefulness of any message posted on the forums. The messages express the views of the authors, not those of Bayoushooter or our moderating staff. Although the administrators and moderators of the Bayoushooter attempt to keep all objectionable material off the Bayoushooter forums, it is impossible for us to review all messages. All messages express the views of the author, and neither Bayoushooter nor our moderating staff will be held responsible for the content of any message. By breaking or not adhering to the above terms, you may be warned/banned appropriately.